So, not all changing tables come with a changing pad. Or, you may not like the one that comes with it. Or it could simply be that you don't have enough space for a changing table, but has cleared out the surface of your dresser/chest of drawers with the intention to make it your changing surface. Whatever the reason is, you now need a changing pad to change your baby's diapers. Let's look at some of the best changing pads the market has to offer now! 2. Changing Pads Cover - Are They Necessary? Hands down the best baby changing pad ever! 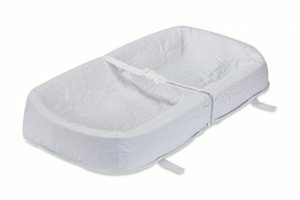 The Summer Infant Contoured Changing Pad has everything we require of a good baby changing pad - it's soft, comes with contoured walls and safety belt and has a security strap underneath to keep it attached to furniture. Measuring at 32 x 16 inches, this changing pad will fit most standard changing pad tables. Remember to attach it to your furniture using the security strap provided so that it will not move around. Even if it's not a changing pad table, you can lay it on any surface and its non-skid bottom will keep it in place. This changing pad is made from durable quilted vinyl that is 100% waterproof and can be wiped clean with just a damp cloth so you can have peace of mind that baby is always lying on a germ-free space. Alternatively, you can buy one of these plush covers that Summer Infant comes out with (there's a huge selection as you can see here). This is the best changing pad cover that is very soft on baby's skin and is machine-washable for easy cleaning. The Summer Infant Contoured Changing Pad is the best infant changing pad because it is so soft (even by its own) it won't irritate baby's sensitive skin. It is very lightweight so you can move it anywhere you want. AND, it is so inexpensive, we know parents buy at least two of them for their convenience! AND, it is so inexpensive, everyone can afford to get one or two! 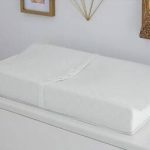 If you're looking for a small changing pad for changing table, your best choice will be the LA Baby Waterproof 4-sided cocoon style changing pad. This baby changing pad for dresser is 2.5" smaller than Summer Infant's so if the latter cannot fit, this will most likely be able to. As its name indicates, it is a cocoon style changing pad with four 4" high sides enclosing your little one to keep him/her safe. Similarly, it has a safety harness with quick release buckle to keep baby safe. 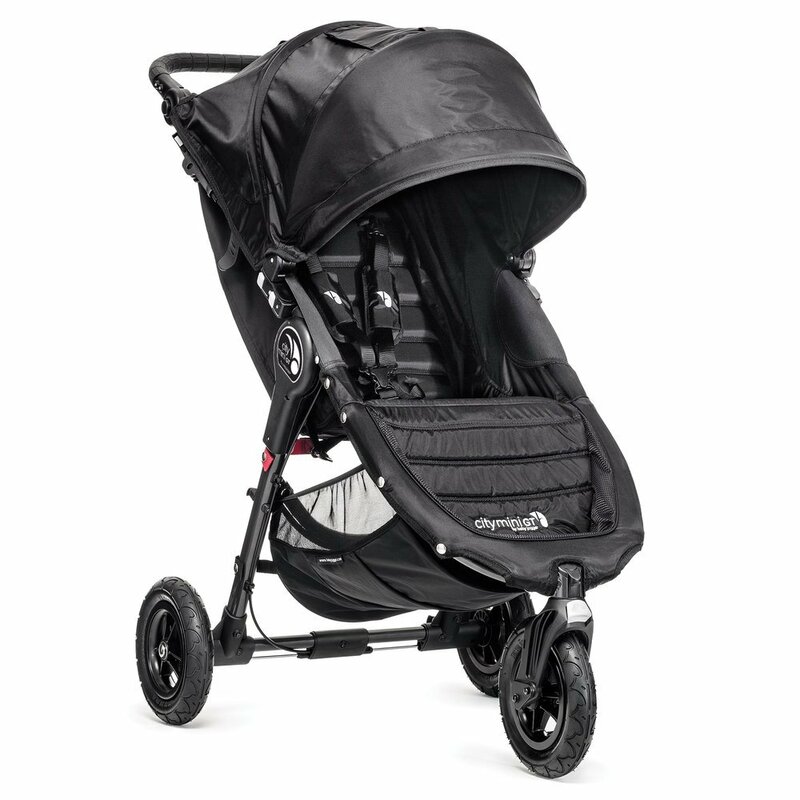 It features a non-skid bottom that prevents the pad from sliding when you are changing baby. You can further hold it in place if by attaching the security strap to your changing table or dresser top, or utilise the two screws provided to mount it securely. The quilted outer cover is waterproof and stain resistant so you can easily wipe it clean with mild soap and water if need be. Anti-microbial, phthalate free, non-toxic and non-allergenic, you can be sure the LA Baby Changing Pad will not cause any irritation to your baby's sensitive skin. This changing pad is more expensive than the rest but it is 100% made in the USA fro domestic and imported sources. It also comes with a 1-year warranty that not many other brands offer. Nonetheless, if you have limited counter space, the LA Baby Changing Pad is the way to go. It has a waterproof, vinyl covered changing pads. This is sized to fit most changing tables and dresser tops. Includes two screws for secure mounting. This has a quick release safety belt which is included. It meets all federal and state mattress regulations. So far, all that we've reviewed are changing pads for the dresser/changing table top. What about when you leave home to run errands with baby? You do need to prepare for his/her changing, don't you? Here's the best changing pad for diaper bag - Summer Infant Quickchange Portable Changing Pad. 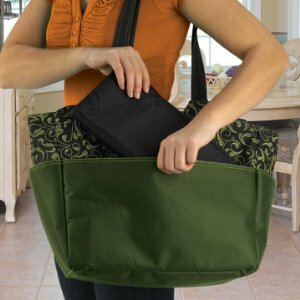 It is a diaper changing pad for diaper bag that is easy to pack and carry. The QuickChange Portable Changing Pad easily eliminates such a state as it offers full body protection for your little one wherever you are. Fully padded, it will be comfortable underneath your baby's skin for changes on the go. 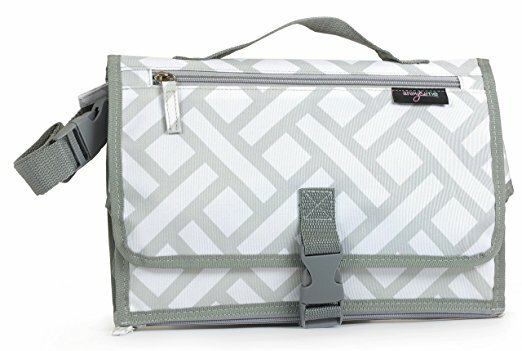 This changing mat for diaper bag will not add to the bulk/weight of your diaper bag. 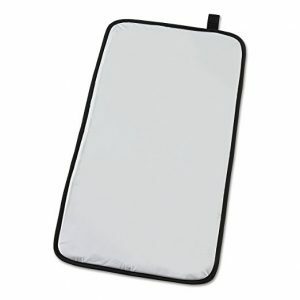 It folds easily and stays securely closed with a hook and loop attachment. You can tuck it away in any bag or even your glove compartment for quick access. And it's basically weightless at 8 ounces only! Sure, public toilets or malls or restaurants' toilets may have a changing area, but do you really want to put your baby on it? We don't know about you, but we feel really grossed out laying baby on a surface God knows when was the last time it was properly clean or sanitised. The QuickChange Portable Changing Pad easily eliminates putting yourself in such a state as it offers full body protection for your little one wherever you are. Fully padded, it will be comfortable underneath your baby's skin for changes on the go and you can prevent him/her from coming into contact with dirty surfaces. And don't worry, it is made of waterproof material that you can easily wipe clean with a piece of damp cloth if there's any accidents on it. As its name indicates, this portable changing pad for diaper bag is perfect for you to carry with you anywhere you go. If there's one thing staple you should pack in your diaper bag besides diapers, it is the Summer Infant Quickchange Portable Changing Pad. 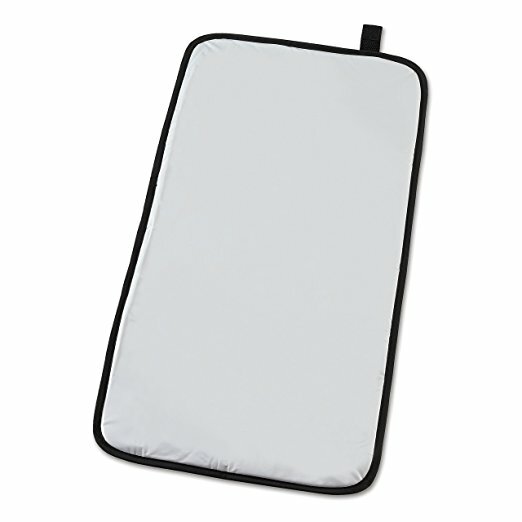 As its name indicates, this is one changing pad that is portable enough for you to carry with you anywhere you go. If there's one thing staple you should pack in your diaper bag besides diapers, it is this changing pad, we reckon. What about when you go travelling overseas? There will be a lot of things you need to pack for baby and if theres anything that allows for a compact and lightweight pack, you will want it, trust us. The Anvy & Me Diaper Changing Clutch with Changing Pad will definitely appeal to you. Yes, it is a changing pad that comes in a small and compact clutch form. It opens up to an extra-long, flared side changing pad for you to change your baby and protect him/her from the nasty germs in public facilities. Don't get fooled by its size - it holds up to 4 diapers, travel sized wipes, toys, change of clothes and even your cell phone and keys. Despite holding all these, it folds down to a slim and stylish oversized clutch that is easy to use, carry and clean. It is the perfect on-the-go diaper changing kit that goes from short car-rides to long airplane travels. 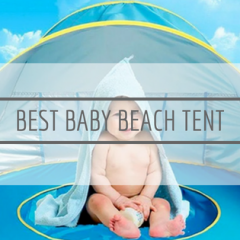 It allows you to leave the house just with it without needing to pack your diaper bag if it's just a short outing. Overall, if you need a grab-and-go changing pad, you cannot go wrong with the Anvy & Me Changing Clutch. 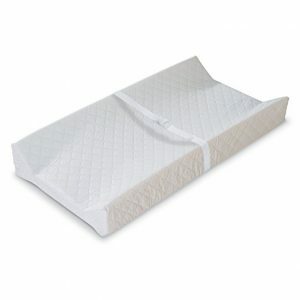 The Summer Infant 4-sided Changing Pad is the best changing mat for those that do not have a changing table. With all 4 walls contoured and enclosed, it keeps your baby secured on whatever surface you lay him on without worrying that s/he will roll out (the walls are 4" tall). Even if you lay baby on a higher surface, it will still be safe because s/he is securely strapped in with the safety belt provided. This changing mat is made from peva vinyl which is durable and easy to clean, not to mention comfortable on your baby's sensitive skin. The cushioning is double layered for maximum durability. 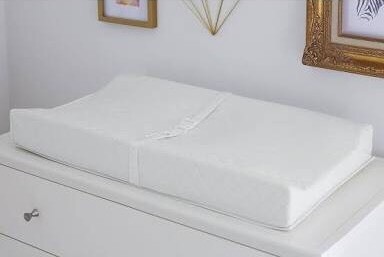 Like all Summer Infant's changing pads, you can get a separate changing pad cover for the 4-sided changing pad to provide extra comfort for your baby. 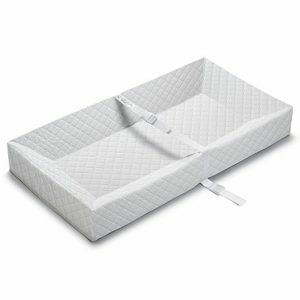 Overall, Summer Infant 4-sided Changing Pad is one of the best changing table pad that works on any surface. 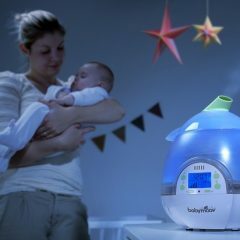 It is comparable to the LA Baby, but the latter is smaller in size which makes it ideal for smaller spaces or work area. 2. Changing Pad Cover - Is It Necessary? You will have notice we mentioned several times in our review above the use of changing pad covers. They are used to cover your baby changing pad and are usually (the good ones at least) made from plush materials intend to give better comfort to your little one. But are they necessary? Well, changing pad covers are not a must or necessity, although they do add another form of protection for your changing pad. Yes, most changing pads nowadays are durable enough and are stain-resistant in that they can be easily wiped clean, but if you have an additional cover on top of it, it further protects and prolong the life of your changing pads. In addition, changing pad covers like these that come in different prints and texture will brighten up and give colour to your nursery. Further, they are not difficult to maintain as you can easily chuck them into the washer to clean and dry. And they are very affordable! At the end of the day, it is entirely your decision on whether or not you want to get a cover for your changing pad. A changing pad works just as fine on its own so if you couldn't be bothered to wash another piece of fabric, we'd understand! So, not all changing tables come with a changing pad. Or, you may not like the one that comes with it. Or it could simply be that you don't have enough space for a changing table. Whatever the reason is, you now need a changing pad to change your baby's diapers. Compare and find the best deals you won't want to miss out on this Black Friday and Cyber Monday!